A survey of people who have had a fire in their home or businesses over the last year has revealed that they are overwhelmingly happy with the response provided by Tyne and Wear Fire and Rescue Service. The ‘After the Incident Survey’ was completed by 102 households and 60 businesses across Tyne and Wear who had a fire between April 2014 and March 2015. • 100% of respondents were fairly or very satisfied with the overall service they received. • 97% were fairly or very satisfied with their initial contact over the phone. • 97% were fairly or very satisfied with the firefighters who attended the scene of the incident. In response to questions about their initial contact with Tyne and Wear Fire and Rescue Service's Control Room 98% of respondents said the operators were polite, helpful, efficient and reassuring. In terms of the fire incident itself, 98% of those who replied to the survey said that the firefighters who attended were professional, helpful, efficient and reassuring, while 98% also felt that crews kept the effects of the fire to a minimum. 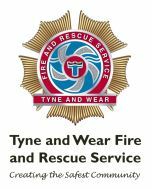 Tyne and Wear Fire and Rescue Service offers free Home Safety Checks (HSC) to people who are more vulnerable to having a fire, as well as to those who have had a fire. This includes checking that people have working smoke alarms and that they are situated in the right place as well as fitting smoke alarms if required; ensuring that they have a fire escape plan in place should a fire break out in their home and that they are aware of the importance of a safe night time routine, such as closing doors, unplugging electrical equipment and safe disposal of cigarettes. All bar 3% of those questioned in the household survey that were offered a HSC took up the offer, while 78% of those that did said they had adopted the advice they were given by fire officers following their HSC. Where appropriate, the Service provides an 'After the Fire' booklet, providing information on what to do following a significant fire in the home. Everyone who received the booklet said it was easy to understand, informative, relevant and helpful in raising awareness of the importance of home safety. Assistant Chief Fire Officer Chris Lowther, Tyne and Wear Fire and Rescue Service, said: "While no-one in Tyne and Wear wants to be in a position where they need to use our response service, it is heartening to know that the vast majority who have are satisfied with the quality of service delivered by our staff - not only in terms of the advice and guidance given, but also the professionalism and skills demonstrated by those who deal directly with incidents." Tyne and Wear Fire and Rescue Service (TWFRS) recently demonstrated its community support by taking part in Newcastle Pride from 17 to 19 July 2015, in what proved to be the biggest and most colourful event in its history. Newcastle Pride is an annual celebration where lesbian, gay, bisexual and transgender (LGBT) people in the community come together to celebrate in a fun and relaxed atmosphere. To support staff, partners and the community, TWFRS was involved in a number of events across the weekend to celebrate diversity and strengthen its positive relationships with the community. To fuel up for the Pride Parade, TWFRS hosted the annual ‘blue-light’ Pride breakfast at Newcastle Civic Centre on Saturday 18 July - in partnership with Northumbria Police, North East Ambulance NHS Trust and Police and Crime Commissioner Vera Baird. Following this, staff joined thousands of people to march in the Pride Parade through the centre of Newcastle.